Aqui está a mansão mais fabulosa. A Vila Riscas. Então eu tinha esta caixa, da minha primeira compra pela Internet, e depois de ter reparado que a Dona Riscas a adorava, decidi transforma-la numa bela de uma casa para ela. Here it is the most staggering Villa. The Villa Riscas. So I had this box from my very first e-commerce buy and apparently my cat really liked, and after observing what a great spot it was for her, I decided to turn it into a house looking box. -Algo com que decorar (something you can use to paint the box). And here is how I folded it, sticked it together and finished it. Eu queria experimentar várias formas de janela, assim na próxima saberia qual o tipo que usar na próxima. compreendo que no final tenha ficado um pouco estranho. I wanted to take the chance to experiment different shapes of windows so I would know which type to use next time. I understand that in the end it ended up looking a bit strange. What a cute cat! And House excellent, you well done!!! A gatinha é tão linda!!!! Shoe Cravings: What's up Doc? 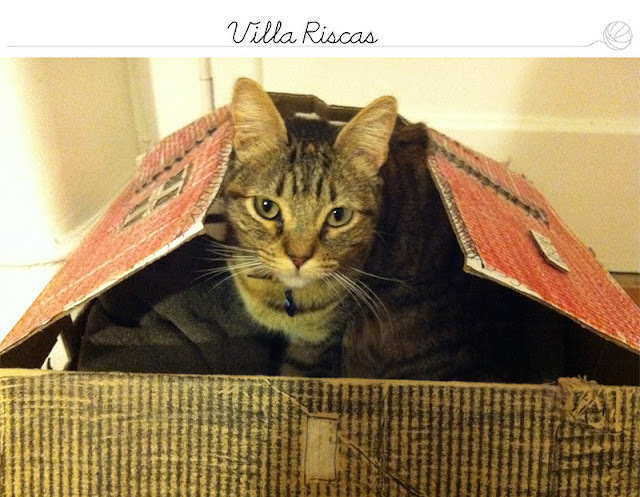 Riscas Says - Hi Everybody!